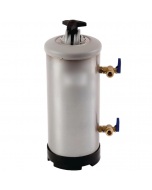 The water softener is connected between the Mains water supply and the equipment by two usually blue flexi hoses and tap (the sort that you might see on a domestic dishwasher). 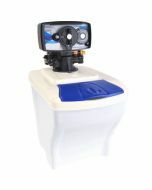 The top tap should be connected to the Mains water supply, the bottom to the machine. When in the working position, the valves should both be at 9 o’clock. Turn both taps to 3 o’clock. 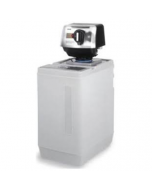 Ensure that the clear pipes are over a bucket or sink as a minimal amount of water under mains pressure may drain from the water softener. Unscrew the larger top tap and remove lid assembly. DO NOT THROW AWAY THE SANDY RUSTY LOOKING CONTENTS as this is the resin that softens the water. 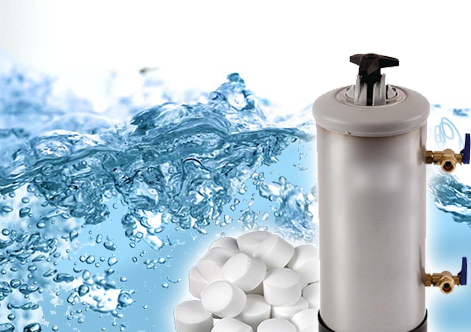 Pour 1 to 2 Pints of granular salt into the top of the softener. Replace the lid ensuring that the rubber seal is clean and tighten the top knob. Turn top tap to 9 o’clock ‐ Make sure that the drain pipe from the bottom tap is still into a drain or sink. Low flow of water will continue from this hose during regeneration. Allow the water to flow for about 20 minutes or until the water going into the sink no longer tastes salty, and runs clear. Turn bottom tap to 9 o’clock.